Tantrum Desire last surfaced on Technique with a taste of their forthcoming LP. That little sample, comprising Adventures in Space and Nightmare, has already established the fact that this album is going to be a defining moment in the big-room turbo-charged style that this production team have made their own. In case you needed any more convincing, though, it’s time for another glimpse at what’s to come. In the beginning is Genesis. 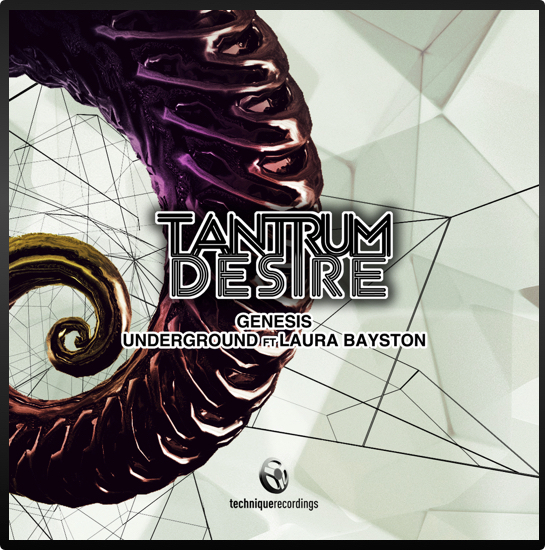 Tantrum Desire have a proven track record in huge build-ups but this one might just be their most monumental to date. First, there’s the evolving pad with tension-building percussive tones. Then the morph into a glitchier, discordant contrapuntal pattern. Then the first taste of bass, adding a darker, grimier flavour. And then the drop hits to put it all together. Precision-crafted interplay between constantly shifting riffs in the low and high registers, uncompromisingly tough drums, bound together with a digital-swing six-eight time signature make this impossible not to move to. Then the next one takes us Underground. This is a masterclass in the use of vocals in dance music, and Laura Bayston’s voice is the perfect delivery system. A quirky vibrato in the intro, combined with her elegantly controlled use of power and projection instantly set this track apart. Then as she turns up the energy, Tantrum Desire supplement her skills with a layer of harmony to build things even further. As the track drops, Laura’s voice is twisted and FXed into all manner of sculpture, successively delivering low-end drive, alto euphoria and even percussion. All this backed with a beat and bassline that leave the ravers in no doubt that it’s time to get up. OK, we all know by now that any Tantrum Desire release are destined for heavy rotation wherever drums and bass are appreciated. And, given that, we all know that their album is destined for instant-classic status. So this release is an important opportunity to get with the programme before the bandwagon even gets rolling. Just like a typical Tantrum Desire build-up, these two tracks are bound to ratchet up the anticipation. So get ready for the drop.